Website redesign -- two words that often strike fear in the hearts of business owners and marketing teams everywhere. Inevitably, these words mean three months focused on site redesign with swarms of lead-up work and planning, content audits, focus group card-sort exercises for site navigation, wireframing, usability testing, frustrations over budget and scope, and even some political maneuvers about who gets what real estate on the site. Marketing—the reason why the site exists—is forced to shift focus away from normal activities to deal with these all-absorbing design issues in return for an educated guess, at best, as to how the redesign efforts will improve business outcomes after the site is launched. But here’s the thing: Marketing can’t afford to take three months off to focus on site redesign instead of the business goals of the organization. So how do you enable marketing to accomplish both with better results? Enter growth-driven design (GDD), a fusion or marriage of sorts between site redesign and marketing, where the two goals become one. Rather watch? Check out this video! Continuous learning and improvement are particularly important since GDD is an iterative, ongoing process that contrasts with a traditional website redesign, which tends to be an all-at-once event. 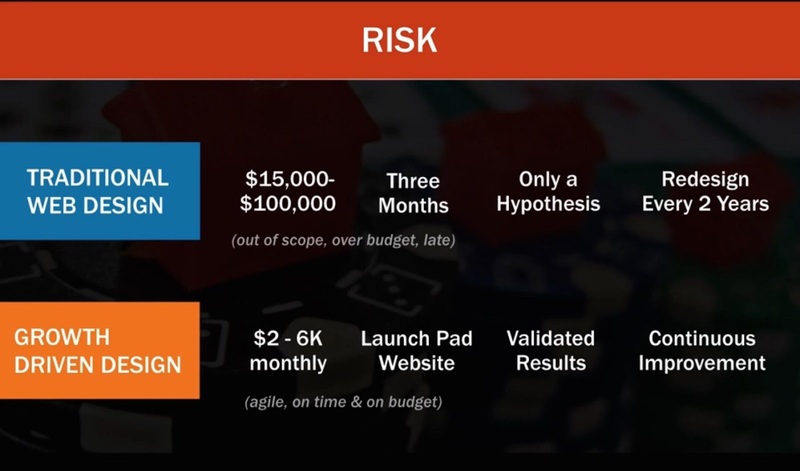 Rather than planning to do everything at one time, GDD focuses on iterations, or “sprints,” for shorter timeframes (which are less risky and less costly). Rather than undertaking a site redesign every two to three years with stale content that no longer aligns with the organization’s priorities, GDD succeeds by making informed performance improvements to your site based on testing, continuous learning, and research that’s derived from visitor behaviors on your site. Instead of monopolizing your marketing team for three months, GDD is tightly integrated with marketing and sales. Site visitor learnings are used to inform and improve the strategies and tactics of marketing and sales and vice versa. In doing so, GDD offers a more adaptive model where businesses can change their marketing plans-of-action based on the conditions and obstacles they encounter. 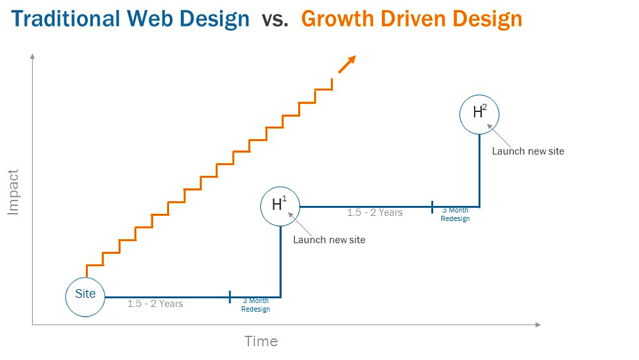 How Does Growth-Driven Design Work? 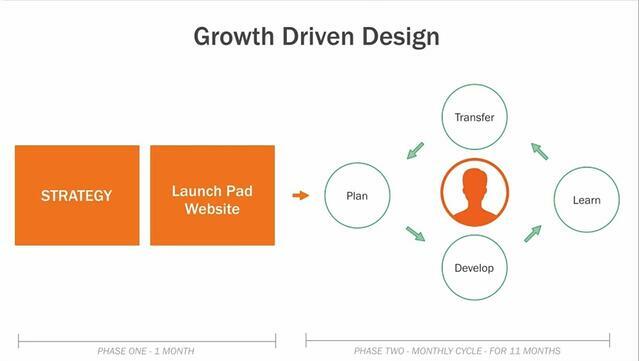 You can think of GDD as having two phases: The strategy and launch pad phase (lasting one month) and the iterative development and continuous improvement phase (which takes place over the next eleven months). 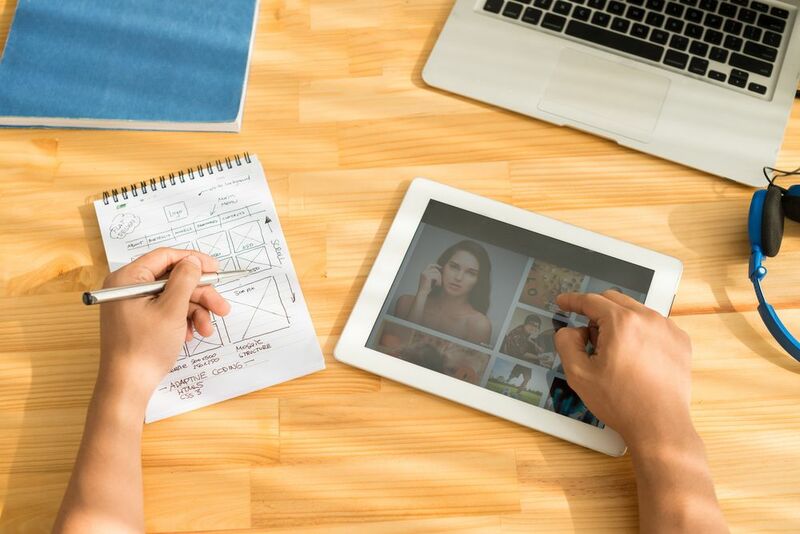 As with traditional web design, the GDD process begins with strategy and goal formation so you know what you’re trying to accomplish, and buyer personas so we know whom you’re trying to reach, what they’re like, and what they care about. With those in hand, you’ll then do quantitative research through a website and analytics audit which will explore how users arrive at your site, interact with it, and why they’re dropping off or bouncing. Overall, you will learn why they are taking a particular action at a particular time, and be able to incorporate this insight into your global strategy and page-specific strategy for high-performing pages. Finally, you’ll brainstorm a wish list of everything you and the client can think of to improve and increase the impact of the site (i.e. new modules, new design or navigation features, integrations, functionality, or additional pages). This process starts with an 80 / 20 wish list, where you’ll tease out 20% of the action that will inspire 80% of the impact. You’ll conduct a nice-to-have versus must-have analysis, and move items off the list that can be phased in during the second or third monthly sprint cycle. Through this whittling-down process, you’ll arrive at your website’s core purpose—what your site is and what it is not. You’ll still be setting up data collection ideas during the wireframing process and checking the data to ensure you’re going in the right direction. Finally, you’ll move to launch the site quickly to get the site live so you can begin collecting the user data that will inform the next step in the iterative GDD process. Ideally, this entire phase one process should take one month to complete. Opportunities to Boost Conversion: This includes content conversion opportunities, conversion points, user-paths and flows, value propositions on the site, split testing, and A/B testing. User Experience Improvements: There may be some overlap with conversion-boosting opportunities, but this list could include UX ideas for improved navigation and a better tagging system. It might also include better search, suggestion or filtering functionality, and the placement of user interface buttons (where they are and how they’re laid out on the site), and how the mobile user UX experience is impacted. User-Based Personalizations: As marketers, we’ve learned the pitfalls of sending mass emails from bulk email lists. Now, we segment our lists to send different messages to different groups. Unfortunately, this strategy hasn’t been fully adopted with our websites. For customers using Hubspot, the Smart Content functionality is personalized to each user. Most marketers think Smart Content is an awesome feature, but lack a system for implementing it with clients. GDD provides that opportunity, offering a system you can study weekly or monthly on an ongoing basis so you can update your wish list and adapt your site based on user personalization, user demonstrated interest, or previous actions taken by users. Marketing Assets to Build: Just as businesses have assets such as machines or software technology, your website is your most important marketing asset. Your blog and social accounts are additional assets you can use to increase traffic and win more lead conversions from your site. Tools such as Hubspot’s Marketing Grader, offers a great value to the end-user who receives a detailed report, as well as Hubspot, who receives links, and increased traffic and lead flow. This is the type of marketing asset you should try to create for your customers. Marketing resources, such as the section of MOZ’s website dedicated to Google algorithm changes, is another great example. This has great value to customers and builds tremendous SEO value for MOZ. 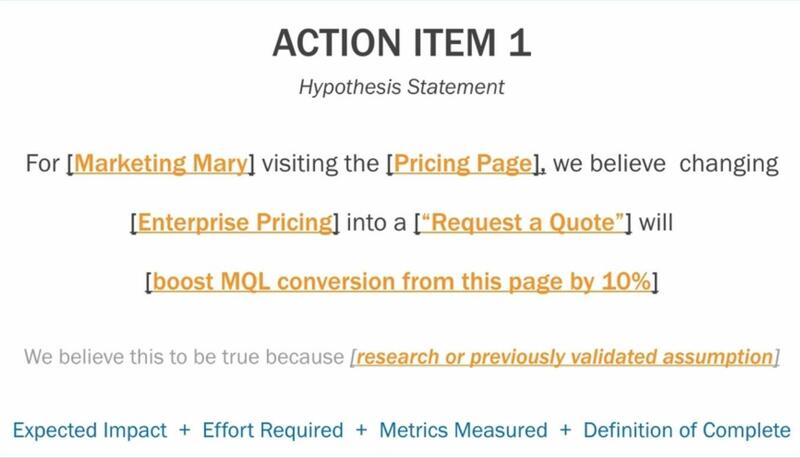 You’ll use these hypothesis action items to gather critical metrics for the success of your GDD site redesign. The “we believe this is true” section could be informed by UX data, previous experiments conducted on the site, research, other previously-validated assumptions, and feedback from your sales and marketing team. Don't forget the housekeeping items at the bottom which you’ll use to build your overall success metric for that particular action— e.g., Expected Impact—and you’ll also want to assign point values to each so you can prioritize for focus and impact. Phase Two of GDD will focus on iterative development/ongoing improvement & validation including monthly sprint cycles for the next eleven months. This will require a fundamental shift in thinking from a traditional website redesign. Your end-users — or visitors to your site — will become the focus of everything you do. You’ll need discover how site updates will impact the user at every turn — what they might say or think about them — and may need to gather additional feedback from them to make this determination. Here you’ll figure out what will be accomplished during a particular monthly sprint cycle by comparing your site’s current performance against goals for the site redesign. Again, you may need to gather additional data or research, including consulting with your sales and marketing team. Perhaps a recent blog post addressed a particular pain point and resonated with your audience. It might have been shared liberally on social media, receiving many retweets. You may then use this data to shift the messaging on your site to better reflect end-user interest and can use it to brainstorm and update your wish list—you may want to bring your clients into this process as well so they’ll have a better understanding of the site’s impact when completed. It may also help you prioritize the most impactful items for your next monthly sprint cycle. Next you’ll create the tasks and deliverables required for your site based on user feedback working with the relevant departments at your organization—developers, marketers, etc. You’ll setup validation tracking codes on your site in order to measure your success metrics and you’ll develop targeted marketing campaigns to drive traffic to the new pages and places you’ve just built on your site—this could be blog posts, email, social content with PPC, or a combination of all of these. Here you’ll ask yet again: What did we learn about the user? You’ll review the data from your experiments, e.g., split tests, which will help you to decide whether to validate or kill the assumptions you’ve made previously. You’ll shift the content on your site accordingly, then publish your results and learnings to inform and educate new team members and for reference later to inform future monthly sprint cycles. You can also provide this information as a deliverable with your clients who could use it to facilitate data-based and data-driven decision-making amongst senior leaders at their organization. Last, but not least, you’ll share what you’ve learned with your marketing team. You’ll create improvement recommendations, like the folks at Hubspot’s Sidekick Growth Team did recently. They used on-site experiments to test three triggers that inspire action on their homepage; namely, social proof, authority, and testimonials as a triggers. Social proof triggers won out by far, inspiring visitors to take the most action. In this way, GDD’s iterative process works hand in hand with strategies to help you achieve your desired outcomes and does so without shifting the focus of your marketing team unnecessarily. We use our own tweaked-up version of GDD to minimize risk, continuously learn and improve, and inform our marketing and sales efforts. We do the same for our customers. We gather and process data from all the clients we’ve worked with over the years, gleaning best practices and integrating them into our site redesign planning process. This reduces the number of assumptions we need to make and creates a stronger jump-off point. Again, leveraging this data, we’ve seamlessly integrated a number of tools and templates into our operating framework that allow us to build launch pad sites quickly and efficiently, reducing the cost of web design for our clients. Are you facing the monumental challenges of a web redesign? I’ll be happy to strategize with you about the ways Growth-Driven Design can improve your business outcomes. Schedule a call with IMPACT and mention that you want to talk to me.